You must be a resident of the United States with a Tax ID/SSN or a resident of Canada. You must complete Watkins International Agreement online, by mail or fax. You must purchase a Watkins Membership ($29.95 + tax). Read and agree to the Watkins Company’s terms and conditions. You also need a sponsor, you can learn more about choosing a sponsor here. While it’s not required, I also recommend you have a debit card (US only) or a credit card (any major credit card or a prepaid credit card US only) or a credit card (Canada) as this will make it easier for you to place orders (online or by phone) and have them delivered faster. You can immediately start receiving up to 35% commission on all Watkins products purchases and you can earn bonus income too! It’s quick and easy – just follow the step-by-step process to get started. 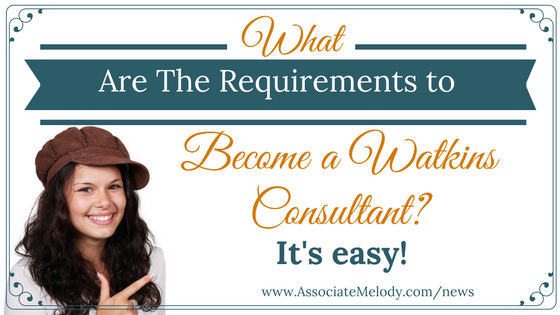 Learn more about the benefits of becoming a Consultant here. Need more information? Request the FREE details today!